N64PT04 - Motherboard Only, 48 Pin Connector Not Included - This is the Nintendo 64 Entertainment System motherboard, the main circuit board for the N64 System. No soldering is required as this uses the "Plug N' Play" N64 48 Pin Connector. The N64 motherboard contains sensitive electonic circuitry and should only be installed by qualified technicians. We cannot be responsible for attempted installation by Non-electronics technicians. The Nintendo 64 motherboard is the main underlying circuit board of your N64 game computer. It is the vital component, containing what is essentially the brains, heart and soul of the system. Everything electronically linked in your system goes through the Nintendo 64 motherboard. The Nintendo 64 Motherboard provides both composite video and s-video through the MULTI-OUT connection. It is rated DC 3.3V, 2.7A and 12V 0.8A, and uses an AC power adapter to achieve this through your 110 volt house current. The system memory consists of 4 MiB of RAMBUS RDRAM (expandable to 8 MiB) with a 9-bit data bus at 500 MHz providing the system with 562.5 MB/s peak bandwidth. GPU SGI 62.5 MHz 64-bit RCP. 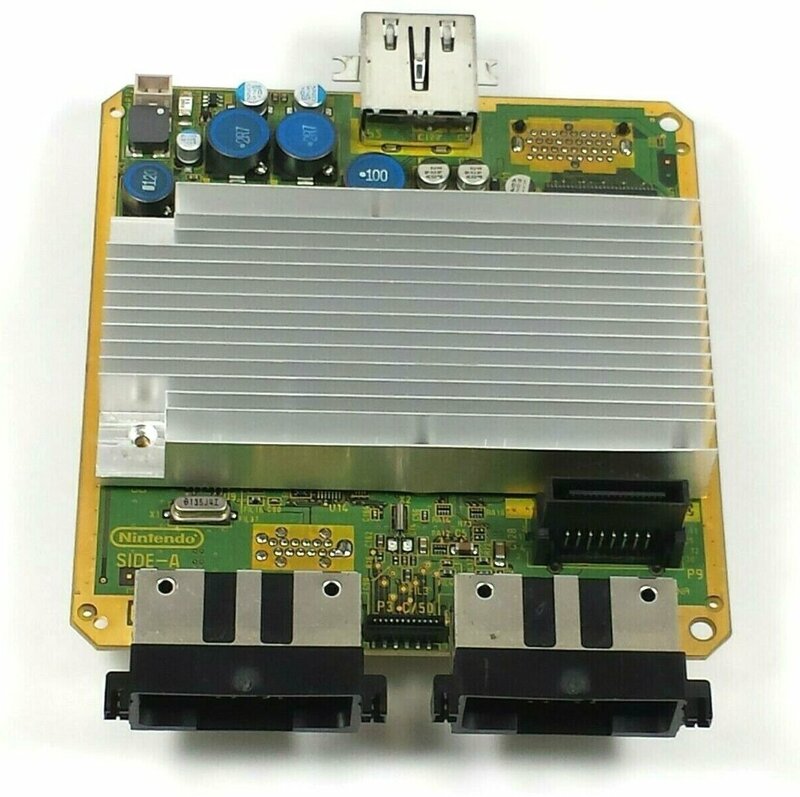 The N64's central processing unit (CPU) is a 64-bit MIPS R4300i-based NEC VR4300, and has an internal 32 KiB L1 cache. The CPU clocks at 93.75 MHz on NTSC consoles and connects to the rest of the system through a 32-bit data bus. The motherboard includes the On/Off switch, reset button, multi analog output module and DC input module. Includes the 4 N64 controller ports. No Soldering is required to replace this Nintendo 64 mother board. Pre-owned, thoroughly tested and guaranteed. 48 Pin Connector Not Included!